Hot peppers may play an essential role and may be a secret ingredient in your beauty routine, but be careful, try small test patch firstly, because this natural remedy can be pretty irritating for sensitive skin. You can use hot peppers raw or topically if you want to remove wrinkles, dark spots and acne scars and have healthy and radiant skin, but this hot spice is more suitable to be used as a hair remedy to get healthy, long and thick hair naturally. Capsicum from hot peppers stimulates circulation of blood to the scalp and consequently improves hair growth and stops hair loss. Besides strengthening hair follicles, hot peppers are going to stop hair thinning, dandruff and split ends. Before you resort to cosmetic surgery, you should try a natural and safe way to plump up your lips. Hot peppers are rich in vitamin E and are known to stimulate blood flow, therefore you can use them topically to make your lips look juicy and fuller. Okay, it’s a short-term solution, but it is cheap and effective. If you’ve got an itch on your foot you might have common infection caused by a fungus commonly known as athlete’s foot. You can try to cure it with home remedies. Hot peppers added to water may take care of the outbreak of athlete’s foot. Hair loss affects people of all ages and there are many products on market today which are harmful, unnatural and can’t give desired results. This is not one of them. By simply mixing one chopped hot pepper with one cup of rubbing alcohol and leaving it in the dark place for about 2 weeks you going to make a natural growth remedy. 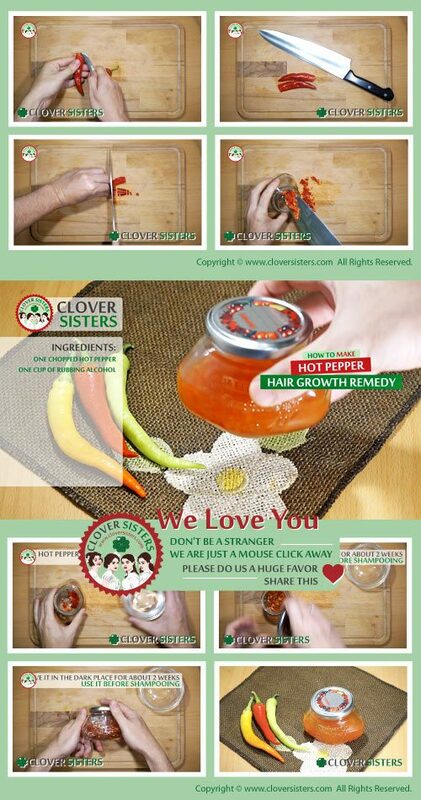 Apply the pepper hair growth remedy on hair before shampooing.